Front cover: Beja man by the well at Bir Vario, Eastern Desert (photo K. Pluskota). It is a flat area covered with black soil and measuring about 150 x 260m in size. The site has been heavily disturbed by many factors; the construction of the railway in 1898 damaged the eastern part of the site. Recently, large parts of the southern part of the site have been dug out by the locals, who make their mud bricks out of the site’s deposits leaving large pits and swamps. In addition, the buildings of the present village extend towards the northern and southern parts of the site. These buildings are built over an old redbrick construction. The site was surveyed and this revealed that it is very rich archaeologically. The fragments of red bricks which measured 200+ x 180mm by 80mm thick (Plate 1) are most probably of Meroitic date. However, the structure and its function cannot be determined at the moment. Two east-west transects were made through the site where the archaeologiPlate 1. Part of red-brick wall cal finds on the surface visible on the surface, probably were concentrated toof Meroitic date. wards the south, and consisted of the remains of wooden posts (Plate 2), fragments of stone grinders, fireplaces and pot-sherds. The fineware pottery sherds show the importance of the site (Colour plate XLV, Figure 2), these being classified as fine-walled cups: ‘egg-shell wares’, Adams’ Family M (Adams 1986). This type is common at Meroe, and is defined by Shinnie and Bradley as Group Fb; it is an unslipped white ware, externally decorated with a combination of stamps and brown painted bands (Shinnie and Bradley 1980, 15455). A fragment of a faience vessel with a large flat base and a thick wall was collected.3 The nearest site which has provided pottery sherds in the same fabric is the Meroitic cemetery at Gabati (Edwards 1998, 66-67 fig. 33, no. 9402). SUDAN & NUBIA Bibliography Adams, W. Y. 1986. Ceramic Industries of Medieval Nubia. Lexington. Bradley, R. J. 1984. ‘Meroitic Chronology’, Meroitica 7, 195-211. Crowfoot, J. W. 1911. The Island of Meroe. Archaeological Survey of Egypt. Egypt Exploration Society 19th Memoir. London. Crawford, O. G. S. 1953a. ‘Field Archaeology of the Middle Nile Region’, Kush 1, 2-29. Crawford, O. G. S. 1953b. Castles and Churches in the Middle Nile Region. With a note on the inscriptions by M. F. Laming Macadam. Sudan Antiquities Service Occasional Papers 2. Khartoum. Edwards, D. N. 1998. Gabati a Meroitic, post-Meroitic and medieval cemetery in central Sudan, vol. I. Sudan Archaeological Research Society, Publication No. 3. London. Hintze, F. 1959. ‘Preliminary Report of the Butana Expedition 1958 made by the Institute for Egyptology of the Humboldt University, Berlin’, Kush 7, 171-196. Jackson, H. C. 1926. 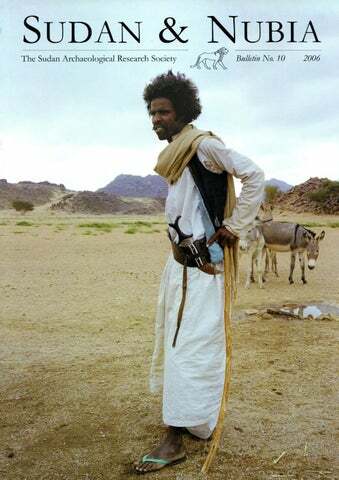 ‘A Trek in Abu Hamed District’, Sudan Notes and Records 9 (2), 1-36. Khidir A. Ahmed 1984. Meroitic Settlement in the Central Sudan. An Analysis of Sites in the Nile Valley and the Western Butana. Cambridge Monographs in African Archaeology 8, BAR International Series 197. Oxford. Shinnie, P. L. 1979. ‘Urbanism in the Ancient Sudan’, Meroitica 2, 89-93. Shinnie, P. L. 1999. ‘Meroe and its society’, Mitteilungen der Sudanarchaologischen Gesellschaft zu Berlin e.v 9, 13-15. Shinnie, P. L. and R. J. Bradley 1980. The capital of Kush 1. Meroe excavation 1965-1972. Meroitica 4. Berlin. Plate 2. Remains of wooden posts and potsherds. site can be dated to the Meroitic period, and added to the distribution map. Further investigation here may enrich our knowledge of the administration and of Kushite policy towards other urban centres in the Meroe region away from the capital. 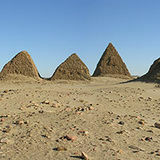 It may also facilitate studies of the nature of the non-royal society discussed by Shinnie following his work at Meroe. It is that stratum of society whose presence made possible the existence of palaces and temples and who were crucial to the maintenance of the fabric of the Meroitic state (Shinnie 1999, 13). Figure 2. Pot-sherds collected from the surface (scale 1:2). Colour plate XLV. El-Frai. Meroitic stamped and painted fineware.